In this Dec. 14, 2017, file photo, Federal Communications Commission Chairman Ajit Pai listens during a commission meeting in Washington, D.C.
Consumers who ask the Federal Communications Commission to investigate complaints against broadband providers would be charged $225 — possibly more than the amount in dispute — under a proposal the FCC is voting on Thursday, NBC News reported. 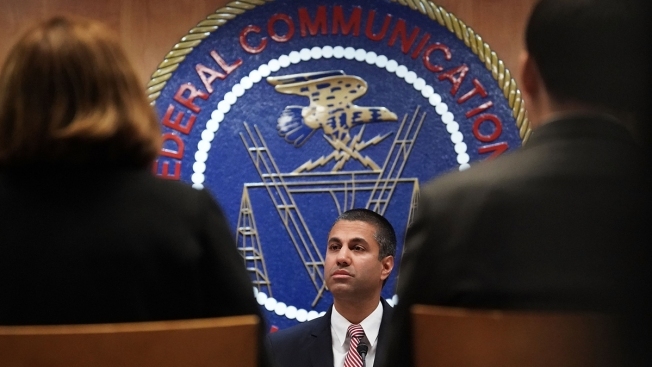 The proposal is expected to pass the Republican-controlled commission, though the lone Democrat called it "bonkers" while two congressional Democrats said it runs counter to the FCC's mission of working for consumers. Thousands of consumer complaints on things like billing and poor internet service are submitted to the FCC each year. The commission typically passes complaints along, but if the new process passes, it will only follow up on disputes if the person making the complaint goes through a formal process that comes with a $225 filing fee.